Archeologists have found new clues about the music early Klondike stampeders were listening to during the Yukon Gold Rush, thanks to recordings found aboard a 110-year-old shipwreck. The three records and a gramophone were discovered last summer in the A.J. Goddard, a sternwheeler that sank in Lake Laberge, north of Whitehorse, in October 1901. 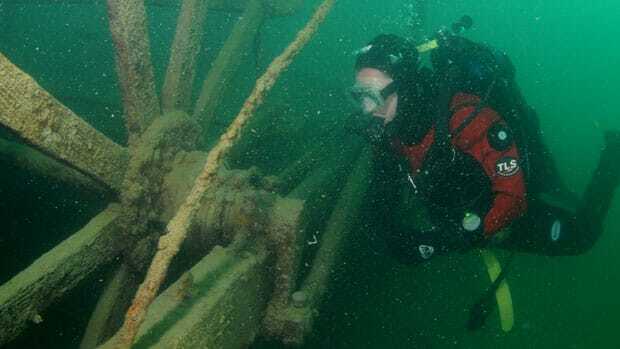 "It's the coolest find on the Goddard, absolutely," Lindsey Thomas, a Texas-based archeology graduate student who has been heading up research on the ship, told CBC News. "To find a record player — it really gives insight to how they were operating throughout their daily lives, and it taught me the importance of music during the period." Thomas said the three recordings, including Rendezvous Waltz and a rare 1896 minstrel recording of Ma Onliest One, were previously unknown to Gold Rush-era music experts. "These are three new songs that we now know people were listening to during the Gold Rush, and they were playing it," she said. "Ma Onliest One was the disc that was attached to the gramophone." Thomas said minstrel songs were popular at the time because they were "easy for the miners and for the people up there to perform." "It became popular in the 1820s, but they were able to put on shows and pass the time amongst themselves as they were stuck in cabins over the winter," she said.